" . . . the visitors were most cordially and even gratefully welcomed . . . "
Welcome to the web site of JASNA's Eastern Pennsylvania Region. Our members are drawn together by an admiration for and an appreciation of the genius of Jane Austen. Our Region is decidedly not a "very confined and unvarying society." We range in years, character, and inclination so as to provide us with a lively and interesting group. Some of our members do comport themselves in manners "most profligate and shocking." Some are simply "wild beasts." Most of us, however, do not "run on in [a] wild way." And all of us find Jane Austen's works endlessly diverting and brilliant. Love for Jane Austen was the impetus for our joining JASNA, but the enjoyment we find in each other's company as we have met over the years to discuss her work is the tie that binds. Together we manage to make our Region a vibrant and energetic group, and are justly proud of each other's efforts. Many JASNA charter members and former JASNA officers comprise our group so that we are fortunate to learn even more about Jane Austen and JASNA history through them. They and many others volunteer their time and considerable talents to enable our Region to provide resources for all our membership. We hope that you find your visit with us enjoyable and informative. We agree with Miss Bates who says, "It is such a happiness when good people get together, and they always do." Be "always on the WATCH." 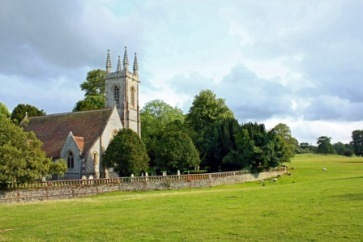 Photo Credit: Photograph of Chawton Church courtesy of Richard Gunn.